Home Uncategorized Haunted Tenor Finally Releases! This news deserves an exclamation point because I wrote the first draft of Haunted Tenor in 2007, and here it is the end of 2017 and it is finally releasing. My favorite opera is Verdi’s Don Carlo. The reason it’s my favorite might seem obvious: I’m an opera fan. But no, I fell in love with the Tudor period of British and Western European history as a teenager. In those pre-internet days, I obtained poster board and carefully typed up (yes, on a manual typewriter) entries for all the Tudors and their closest relatives, including of course the kings and queens of France and Spain with whom they intermarried and who are prominent in Don Carlo. I drew lines in black marker with a ruler and taped the entries to their proper spots and made my own genealogies of all the Tudors, Plantagenets, and Stuarts who intermingled in the sixteenth century. It’s safe to say I read every book about those people that was available in my public library, both historical fiction and factual biographies. None of these were the fluffy and inaccurate historical fictions we often see today. My Tudor love entered a latency period during my college and early working years, and then a random choice of an opera to see brought it back powerfully. The Metropolitan Opera’s production of Don Carlo in the late 1970s was a detailed and historically correct visual representation of the clothing and the monumental settings of these royal people’s lives. Princely figures who supposedly had the best of everything and plenty of power were entrapped in their stifling garments and in the rigid formalities of court customs. They were dwarfed by the palaces in which they lived. Their intimate personal desires were routinely dashed by the cruel exigencies of political expedience and—as terrifyingly shown in this opera in the scene with the Grand Inquisitor—by the menace of powerful religious leaders with their own agendas. Giuseppe Verdi’s brilliant music for Don Carlo conveys the characters’ brief hopes soon snuffed out, the sense of oppression and doom, the efforts to accept an inevitable, miserable fate, and more. The opera is based on Friedrich Schiller’s play, Don Carlos, which simplifies and partially falsifies the historical facts in order to make them more romantic. Instead of being doomed by the incestuous genetics of the Spanish royal dynasty as the real-life Don Carlos was, he is doomed by his emotional inability to get over the destruction of his romantic hopes. I loved it. The music was incredibly moving. The story was incredibly moving, too. I wanted to live it, just as I had wanted to live in the Tudor era as a teenager. My solution to this dilemma—since time travel was not available—was to write Haunted Tenor. 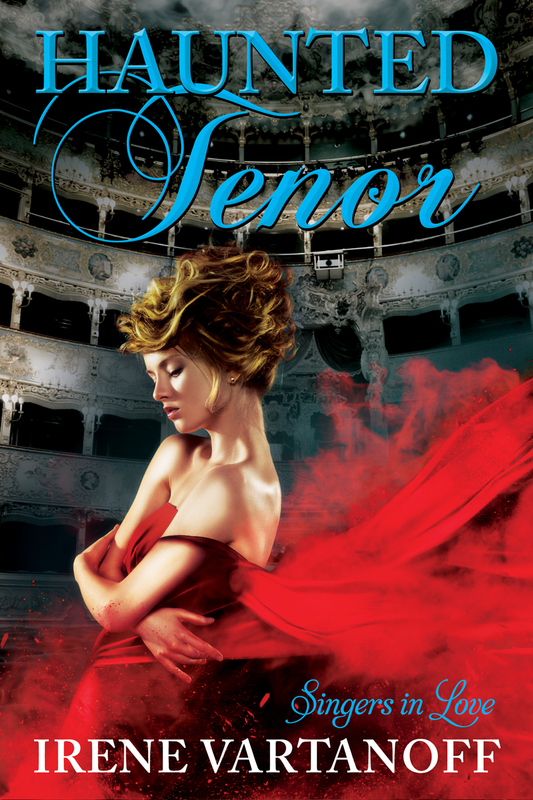 In Haunted Tenor, my heroine knows nothing about opera but because she works in an opera house she is ordered to see some performances. When she does, she begins to feel very strange compulsions regarding the opera Don Carlo. She has odd dreams in which she’s a main character in the romantic drama. She feels drawn to the tenor who sings the role of Don Carlo, too, and begins to seek him out. They become romantically entangled even as they try to solve the mystery of the supernatural pressure she keeps feeling to put herself into the story. Marshall McLuhan’s theories about hot and cool media intertwine in Haunted Tenor. Although traditionally opera has mostly been a “hot” medium—engaging only one sense, the ear, in a major way although often there was spectacle—in modern times acting has come to be important in opera. The production of Don Carlo I first saw had everything necessary to be a “cool” medium. Wonderful music wonderfully sung, convincing acting, and great costumes and sets. It drew me in, creating the kind of impossible yearning that so many of us feel today as we briefly live in a world invented in a movie or a television show. Or a novel, and that was my solution to the angst of wanting to be part of something it was completely impossible physically to join. Thus, Haunted Tenor is a sweet contemporary romance with a ghost story and a tiny bit of steam. My lovelorn heroine suffers the pangs of seemingly unrequited feelings just as Don Carlo himself suffers in the opera. But this story is also my love letter to one of the greatest operas ever written, my way of climbing into the story. I’m absolutely thrilled to be releasing it at last. Click the icon below to buy the ebook or the print edition, to read it in Kindle Unlimited, or just to read a sample.